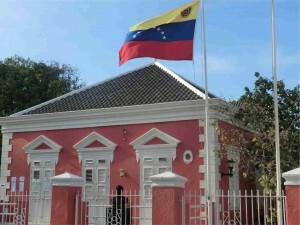 WILLEMSTAD – The Venezuelan Consulate in Curacao is open again. The Consulate was closed after he Venezuelan Minister for Foreign Affairs, Elias Jaua, reported that the consular office of Venezuela in Aruba suffered damages by a vehicle on February 21 of this year. “We want to make a call to those who have promoted this hatred, to those who have instilled this intolerance leading to a Venezuelan citizen, residing on that island, to attack a consular office of your country putting his own lives at risk,” the Minister said. He accused the media of inoculate hatred. “I am amazed of how far the ability has come to inoculate hate. With a perverse use of social networks, promoting intolerance of class and race,” Jaua said. The Consul Sonia Alvarado Rossel has returned on the island and the Venezuelan Consulate is offering all its services as normal. The Consulate will be closed on Thursday, Friday and Monday due to Holiday.